Monsanto Co. has agreed to acquire VitalFields, an Estonian farm management software company, for an undisclosed amount. The startup will become part of The Climate Company, a Monsanto subsidiary that helps farmers maximize harvests through its Climate FieldView platform. The acquisition marks The Climate Company’s first step into the European market. 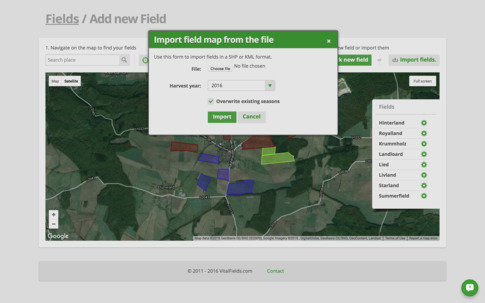 VitalFields offers a tool for farmers to plan, manage and analyze their activities in the fields, including simplified tracking and reporting of pesticides and fertilizers to ensure compliance with European Union environmental standards. VitalFields was founded in 2011 and is available in seven European countries. In January, Monsanto made an investment in the company through its venture capital arm, Monsanto Growth Ventures. The fund's portfolio includes a selection of companies active in key areas of agricultural productivity.The company charges farmers 1 euro per hectare per year. The platform, which launched in 2015, delivers customized insights that help farmers make data-driven decisions with confidence to maximize yield potential, improve efficiency, and manage risk. St. Louis-based Monsanto was purchased for $66 billion in September by German chemical conglomerate Bayer AG, and the combined companies now command more than a quarter of the combined world market for seeds and pesticides. In 2015, Bayer reported sales of $46 billion and Monsanto had sales of $15 billion.